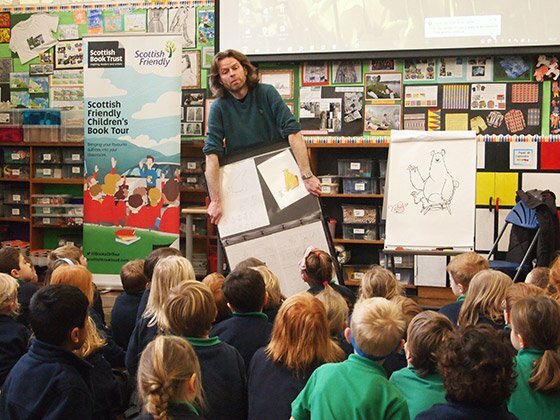 In January 2016 the Scottish Friendly Children’s Book Tour visited primary schools in Nottingham with the award winning picture book author and illustrator Ross Collins. A. Tough question. I think maybe Edward Gorey. I tracked his house down once when I was in Cape Cod. I got up the nerve to knock on his door but he either wasn’t in or wasn’t opening his door to Scottish stalkers. I’ve no idea what I would have said if that door had opened. A. There is no book that every child should read. It’s different strokes for different folks. ‘Angry Arthur’ by Satoshi Kitamura was his first book and is still as perfect as it was 34 years ago. ‘Wild’ by Emily Hughes was her first book 3 years ago and is just as good. A. I’ve always thought I’d like to be a film director but I think the truth is that I’ve got too used to working in my own wee world and having to share might not work for me. A travel writer would be good. Getting paid to travel – what could be better? A. I have a little drawing by John Byrne that makes me very happy every time I look at it. A. Cate Blanchett seems to be able to turn her hand to anything. A. I have a very strong memory of eating about thirty perfectly ripe plums while watching Blankety Blank once. That’s hard to beat. A. Buffallo Bill toured his ‘Wild West Show’ to Glasgow in 1881. There were posters all over town in advance with a picture of him and the legend ‘I AM COMING’. Can you imagine how amazing it must have been to live in dreich grey Glasgow and see Bill and his unhappy native American indians roll into town? It would have been like the martians landing. Completely un-pc now of course – but imagine it! A. Many books for many reasons, it’s so hard to name one. Like many people Joseph Heller’s ‘Catch 22’ made a huge impression on me as a teenager. It told me more about the futility of war than any lesson could and it also taught me that most people don’t have a clue what they are doing which I still find very useful. A. 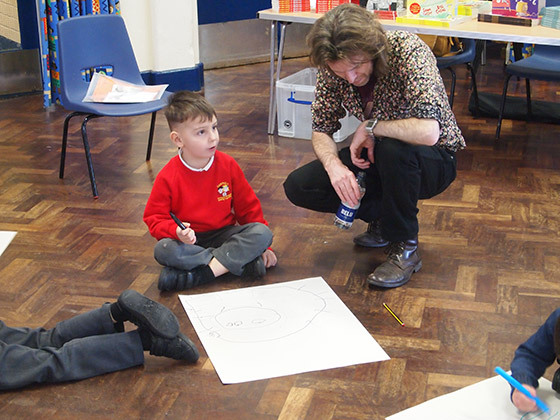 When it comes to really young fiction I think what most people should do is to go to book shops and libraries and study what is actually out there being published. Lots of people have great ideas and then write them down but don’t look at what books actually look like. If you familiarise yourself with the market you are trying to write for and write within those perimeters it’s far more likely that publishers will be able to picture how your idea may work for them. It seems obvious but not many people seem to do it. A. Probably some stupid piece of film memorabilia.